This Lavex Janitorial natural brown kraft, non-perforated and embossed hardwound roll paper towel is a valuable choice for all types of roll towel dispensers with its universal core size. These towels are great for high-traffic areas and will help cut down on storage and labor costs versus folded towels. Each roll is 350' long. Just your traditional paper towel, it's very rare that we need to change this or order another one rolls. It gets the job done well. These paper towel rolls fit perfectly in the dispenser. They come out easily and roll smoothly. They last a very long time and are great for bathrooms. Finally!!! We were thrilled to find these roll towels that fit our Tork dispenser. The quality is even better than towels we previously purchased from a different supplier. Great product and a great price. The rolls look small, but when you compare to other brands, it's the best deal for the length. I was worried they'd be thin because of the price but it is not at all. Absorbs well and doesn't tear when you're trying to dry your hands either. This is a very standard roll of paper towels we've used it in our dispensers for years I've been buying from This site. It's cheaper than me buying it at restaurant depot even with the shipping costs. 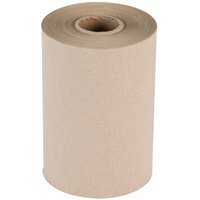 Great product, we love these paper towel rolls, they work nicely in any dispenser, no wasting of any of the product. Great buy for the price! We like this Lavex Janitorial Natural Kraft Hardwound Paper Towel, 350 Feet / Roll - 12/Case, Its a economical paper towel to dry your hands, fit perfectly in the dispenser and also come out easily. We tried thise roll towels and were pleased. They are much less expensive than the ones we were ordering and have not had one complaint from customers or staff. We tried to get the customers to switch to these because of the price but these are not high quality. They are thin and don't absorb water as well as similar products. The low cost shouldn't cause concern, we've switch over to Lavex for several janitorial/housekeeping products and have been extremely happy. There hasn't been a single issue with any of their products, the savings are great, and the quality is up to par with the "premium brands." I would highly recommend this item as a great cost-saving alternative to any other hard wound towel on the market. We do a lot of hand-washing in our food operation and used to have the individual towels. The roll gives much better use and results than individual towels letting you adjust how much you need for different uses. These paper towels fit our dispenser perfectly and are great for our workers. The price is fantastic, we go through a lot of paper towels in a day! These are very thin towels.A good price though.If you have the web plus then its a good value to ship.They also have better ones here. These paper towels are used in each bathroom here at beans and the belfry and they are perfect. they are easy to install in the dispenser along with the removal. a very much used product! Although I didn't read the description 100%, and the diameter of the hole for the rolls didn't quite fit my dispenser, I made it work. I am very happy with them, they absorb alot of water. Lavex has great products. These towels are no exception. Good quality kraft roll for bathrooms or hand towel dispenser. Price is great for a case of 12 as well. Great quality for the price! I use these everyday in my restrooms in my office and they are super affordable for you to wipe down sink or dry your hands. Webstaurant is the best to purchase these towels they have the best price, even better than my distributor! They are good quality and fit perfectly in my dispenser. I won't buy them any where else. These natural roll towels are 350 foot rolls which work well in older dispensers that can't handle the larger 800' rolls. Nice towel for general hand drying. These paper towels are a perfect fit for us - and the price is great! We use a lot of papers towels, so cost efficiency is very important. These roll towels are very thin. They get jammed in our 5 roll towel dispensers. I ordered them a long time ago from here and then stopped. When i was placing my order recently we were low so i ordered them again. Now i realize why i stopped ordering them from here previously. The price is good but if the product doesn't work as expected then price is irrelevant. Thank you for the review! We’re sorry this is not working for what you need it for. We suggest trying this Lavex Janitorial Aircell (TAD) 8" Premium Roll Towel 800' Roll - 6/Case instead. Lavex Janitorial Natural Brown Kraft Roll Towel 350 Feet is a great value! For the price per case, it is a good quality paper towel! It's not too thin which is very important to me when I was selecting this product. Great, economical choice for bathrooms. Just as nice as the more expensive brands and just as nice in quality! These towels last forever! Nice and easy to store. Great for the environment too. Thanks for offering a great product at a great price. Great value for these rolls. The price shipped was just a little cheaper then getting it form my supplier. Used for hand drying and window cleaning. After receiving invoices from a supply company we bought from locally, I knew we were overpaying- by a LOT. Finding webstaurant was a lifesaver. Even after somewhat high shipping costs, we STILL end up saving hundreds of dollars per month on all the janitorial supplies we purchase. Perfect fit for our restrooms and at the perfect cost. Who would of thought that purchasing paper with shipping would be cheaper than buying from a distributor. Well it is, and they got it to me in two days! Good quality towels, the 350ft rolls fit in standard and slim dispensers. They are the way to go! Perfect fit for our dispensers. They are quite durable and easy to clean up. Our customers have no complaints and they are cheaper than other options. What can I say they are brown paper towels. They dry your hand's well. The towels never jam in the dispenser and best of all they are at an affordable price point. These brown paper towels are perfect for use in the bathroom at home. I am very satisfied with this product, and can not wait to order them again. i got this item from a another restaurant store couple years ago and this item works great and i relay think that every restaurant should have this item. i used this item all of the time around my house when i am cleaning. The paper towels themselves are of good quality and do not tear easily. I would recommend measuring your dispenser to ensure it will fit. I purchased these and as it turns out I would like to have purchased a larger roll (more than 350 Ft) so I do not have to change them as frequently. These paper towels are a nice thickness the only thing I didn't like about these is that the length is short and do not fit my dispenser so universal they are not. It's a great product for our use, we use to clean windows, other paper towels fall apart easily but so far this one seems to be holding up well. Very good paper towel. They work great and have never heard any complaints from customers. Very cost effective as well. As others have said, not very good for cleaning but great for hand stations. Great value! The "green" factor makes these paper towels a plus! Excellent for hand washing stations as well as cleaning up small spills. Great price!!! These paper towels are a good value, and a natural product which is great given the Green trend these days. They are not great for cleaning with but for a hand washing station they are good.